BBC One celebrated EastEnders’ 30th anniversary with a series of live shows broadcast from February 17-20. In what can be described as the shows biggest ‘whodunit?’ storyline in years, fans endured months trying to solve the mystery behind the murder of Lucy Beale. The true culprit was revealed as eleven-year-old Bobby Beale in a special double-episode shown February 19. EastEnders broke records across the board and saw its highest viewing figures in years, becoming the only programme to achieve over 10 million viewers in 2015 so far. How does YouGov BrandIndex data reflect the excitement? And what was the effect on the BBC more generally? BBC One’s Word of Mouth metric (whether respondents have talked about the brand with friends and family in the past two weeks) increased from 6.0% to 12.9% since the 30th anniversary week began on the week of February 16. YouGov’s Attention metric measures the percentage of respondents who have reported hearing anything, either positive or negative about a brand over the past two weeks. Here we see the score increase from 12.7% to 17.6%. It’s clear therefore, that EastEnders biggest week contributed positively to BBC One. The BBC used social media extensively over the week, achieving true interaction with the show’s viewers. BBC highlighted the live scenes with the hashtag #EELive in the corner of the screen. In addition, the ‘Who Killed Lucy Beale?’ storyline sparked a series of conversation on Twitter. 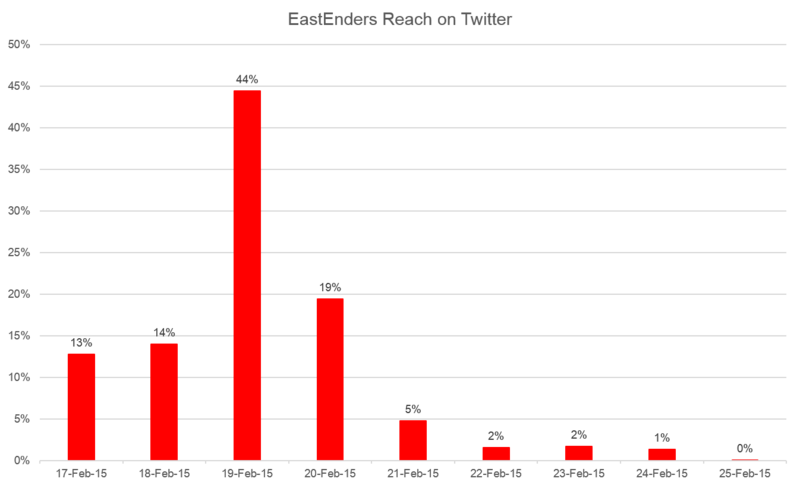 Using YouGov’s social media analysis tool, SoMa, we pulled the conversations from our Twitter panellists that mentioned Eastenders, #Eastenders, #EELive, #HowsAdam and #WhoKilledLucy?, between February 17 and February 25. During this period, over half (51%) of the UK Twitter population were exposed to the programme. The night of the big reveal (February 19) had the biggest success. Not only did EastEnders manage to pull in an average of over 11 million viewers from both episodes aired that evening, we found that the percentage of people that had either posted or heard of the programme on February 19 was 44%. SoMa is also unique in its ability to offer insight into exactly what demographic groups heard a mention of a particular brand. 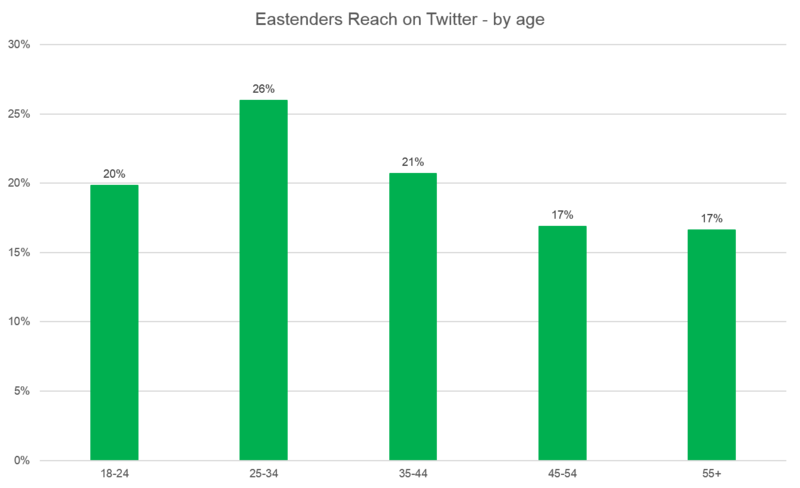 If we look into EastEnders’ Twitter audience, there isn’t a wide disparity between all age groups, however, we see that slightly more adults aged 25-34 were exposed to a tweet relating to EastEnders during the live week (26%) compared to those aged 45-54 and 55+ (17% respectively). 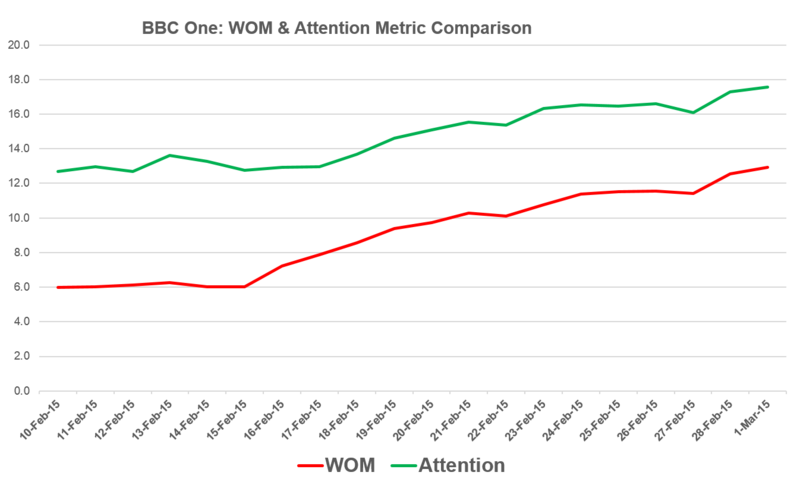 The week was an undoubted success for the show and the BBC more generally. They will be united in their desire for this coverage and excitement to transfer to more permanent viewers, as well as the hope that lapsed fans will be persuaded back. Time will tell if the buzz around the show can be maintained. The article originally appeared in City A.M.